Yes, But Does It Match Comrade Trump’s Curtains? 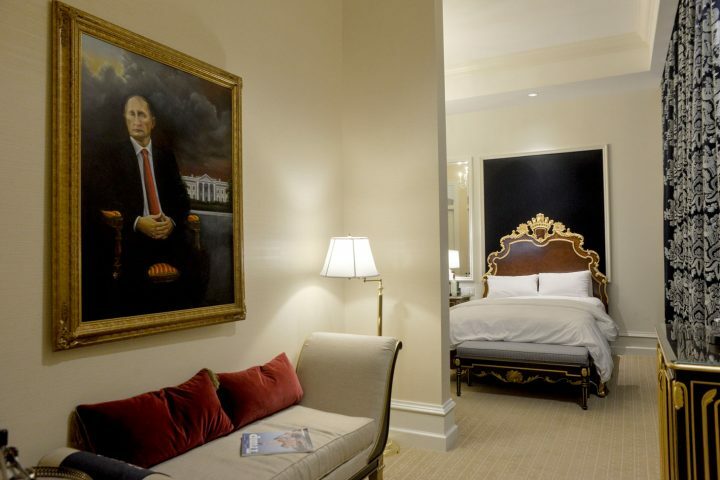 Artist Brian Whiteley claims he hung a painting of Russian President Vladimir Putin in a Trump International Hotel suite overlooking Pennsylvania Avenue — and no one noticed. This entry was posted in 4th Reich, Comrade Preznint Stupid, The Russian Usurper, Pooty-Poot Putin. Bookmark the permalink. 5 Responses to Yes, But Does It Match Comrade Trump’s Curtains? Yeah, it’s like a race car bed for grownups (note: grown ups, not adults). One can only imagine the twisted dreams that environment inspires. When Trump stays there, do they have to wipe kiss-prints off the painting every day? Putin is posed in a fancy chair far out past the front lawn in a place that doesn’t really exist while huge dark storm clouds hover of the White House. This is disturbing on so many levels! it’s entirely possible people, if they even pay attention to hotel art (unlikely, unless it’s elvis on velvet) they don’t even know who it is.